Discover a brilliant way to get your child to tell the truth and stay honest. She breaks the rules and says, “It wasn’t me!”. Now Ruthy is “Truthy Ruthy”. How does Dad change the rules? Read our humorous, fun story to find out! The book includes wonderful and delightful free gifts with suggestions for entertaining true-or-false games for family activities, for developing imagination and improving communication. Don’t forget to take the Free Gifts! My creative family was the source of inspiration for me to write this book. We too had difficulty with one of my children who tested the boundaries of truth, until my husband surprised us all with an unconventional and brave concept, “People are allowed to not tell the truth!”…Within a week my child asked us to tell the truth; he was convinced he himself had invented the truth…and he was so proud of himself. We learned just how much a creative idea can be worth! Twenty years have passed since then and one could say that the most pronounced values our family has include: integrity, creativity and a sense of humor. She painted on the walls and said … “It wasn’t me”. She grabbed the ball from her sister and said … “It wasn’t me”. She annoyed Lady, the family dog, and said … “It wasn’t me”. Ruthy’s dad thought of an unusual idea! I write inspirational books for people of all ages. I write for those who are curious, who are open- minded. I write for people with a sense of humor. For people who are willing to taste something new, take a few risks and enjoy the ride. My books open the readers’ minds to endless possibilities and alternatives in their journey through life. 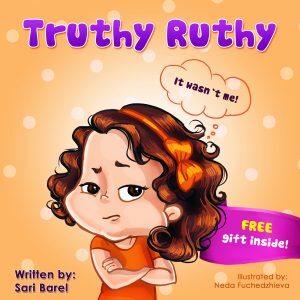 I am the author of the popular best-selling “Truthy Ruthy” series of books for children and their parents. In addition, I am an international expert in the development of creative thinking. When I’m not writing, you might find me leading a creative-thinking and innovation workshop. I co-authored the “Think Like a Zebra®” book series and method, which introduces a unique concept for escaping restrictive thinking patterns. My creative journey includes almost anything to do with writing, from copywriting to film writing and, and of course, writing books; acting; painting and helping people in their life-journey as a coach, mediator and educator. I hold an MEI – Master’s degree in Entrepreneurship and Innovation (from ISEME, an extension of the University of Swinburne, Australia) in addition to a teaching degree. I am passionate about changing the world, making it a better place for everyone. The first step to reaching this goal is to give every individual the ability to change their own reality by themselves. That’s why I write. To inspire people – young and old – to break restrictive thinking patterns. I am inspired by People who find ways to make the impossible possible; People who change the world; People who think differently; Wisdom gained through time on the planet; A child’s endless ability to create; Animals in nature, and how they use their wisdom to survive and overcome hurdles; An entrepreneur’s ability to create something from nothing; An artist’s ability to create something from nothing; The flexibility of the human brain; Passion; Enthusiasm; Curiosity; Failure; Opportunities; Alternative And more….